One if my favorite “kitchen sink” meals is a hearty quiche. I love that you can pretty much throw any vegetable, meat or leftover dinner scraps into a bowl, whisk up some eggs, make a simple crust and throw the darn thing in the oven and walk away. This recipe is awesome because the crust is made with almond flour instead of traditional flour which results in a slightly nutty flavored crust with a lovely texture. I’m a big fan of eating this quiche at room temperature but it’s wonderful served hot straight from the oven or even chilled. There’s really no wrong way to serve this puppy up! 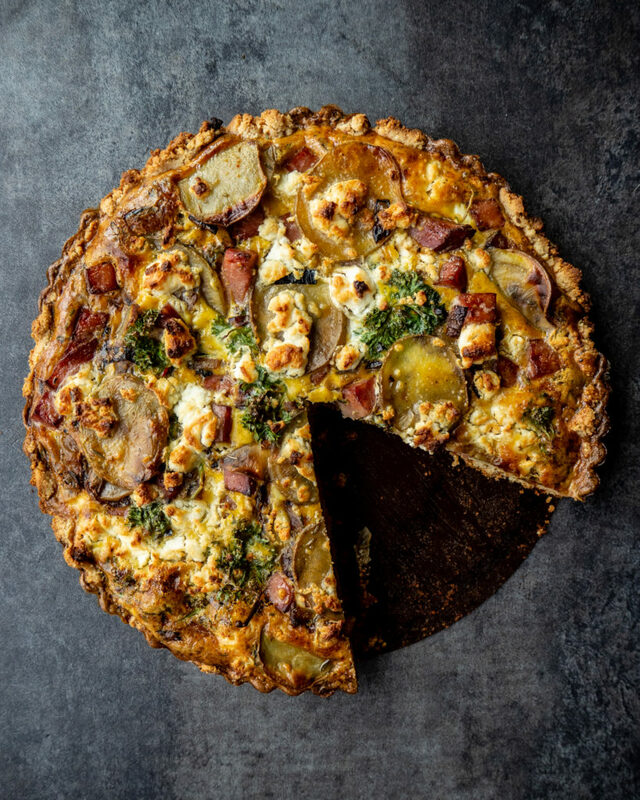 The inspiration for the filling in this quiche is because we’re harvesting overwintered leeks at the farm and we paired them with potatoes we’ve stored from last year’s harvest. I of course wanted to add some ham from our pigs to bulk things up but feel free to swap out the veggies with what you’ve got on hand and the meat with anything from sausage to bacon. Regardless of what you fill your quiche with the crust is a must! Place a rack in the center of the oven. Preheat the oven to 400F. Grease a 9 inch tart pan or pie plate with oil. In a large bowl whisk together the almond four, garlic, thyme, salt, pepper and crushed red pepper flakes. Stir in the oil and water and mix until well combined. Press the dough into your greased tart pan or pie plate making sure the dough goes at least 1 1/4 inches up the sides. Bake until the crust is lightly golden and firm to the touch. About 18 minutes. Heat the cooking fat in a large cast iron skillet over medium-high heat. Add the leeks and cook, stirring occasionally until beginning to brown, about 5 minutes. Add the potatoes and ham and continue to cook, stirring occasionally until the veggies are tender and ham is lightly browned. In a bowl, whisk together the eggs and milk. Add the sauteed veggie mixture to the bowl and sprinkle with plenty of goat cheese, salt and pepper and chopped parsley. Pour the mixture into the pre-baked crust and place back in the oven and bake until the crust is a deep golden brown and the center is set. About 30-35 minutes. If the crust begins to brown too quickly place tin foil around the edges to prevent it from burning.